Disclosure - Before anyone sics their dog on me for being tight-fisted, I must first disclose that for many years, my siblings and I placed our parents on a monthly allowance. The idea behind this was to provide them with regular income they could look forward to. We also cover all their medical expenses, and retained the services of a cook/butler to look after them. That settled, now I can say my mind. A common prayer in Nigeria is 'wa jeun omo.' Loosely translated, this means that parents will derive financial and other benefits from their labour over their children. Ordinarily, this is not a bad prayer track to travel. It isn't essentially a good one either, partly because, on close inspection, it exposes the entrenched intent of the hearts of many Nigerian parents. When it comes to securing the future, I see a clear blue sky between our culture and that of the West. In Nigeria, many parents see their children as the key to their financial future. However, most Western parents see themselves as the key to their children's financial future. As basic as these two opposing propositions are, they influence the approach to money, spending behaviour, and the financial/savings culture of each of the protagonists throughout their lifetime. No doubt, parents everywhere in the world feel they must not only educate their children, but also give them the best start in life. What makes Western parents to stand out, in my view, is that they often do not ask for anything in return. They almost always do not expect to be taken care of by the children at their old age. Rather, they prefer to make their own provisions and shy away from becoming a burden to their children. Yet, and most importantly, they have a lifetime commitment to their children that continues even after their death. Many Western parents see it as their duty, almost in a messianic way, to make their children better off on their own death. In order to achieve this, they scrimp on food, what they wear, the car they drive, holidays and even heating of their homes so that they may leave a substantial inheritance for their children. I once worked with an English lady who was probably in her forties at the time. Although she had no known illness, she set up a payment plan to pay for her funeral. She did not want to burden her only daughter with any expenses whenever she dies. As far as I know, she is still alive and kicking. In many parts of Nigeria, the converse is the case. I must admit that African parents often work harder than Western parents to secure the education of their children. However, African parents also see their children as a means of shoring up their own future financially. The effect is seen in reckless spending on cars, ostentatious living and hard partying, which means that many parents leave their children with nothing when they die. This ordinarily would not have laboured my mind but for the entrenched and acceptable belief that it is the right of parents, having worked hard over their children, to sit up and enjoy the fruit of their labour. Some parents would place a curse on their children if this so called 'fruit of their labour' is not forthcoming. Some demand the type of car, clothing or regular gifts they want their children to buy for them. I have heard of parents who threaten fire and brimstones if their children do not give them a debt-imposing 'befitting' burial when they knock it off. Others prefer certain children to others depending on the largesse they enjoyed from each one. Few have any strategy for their grandchildren. Am I suggesting that Western parents are better? Not in the least! But their approach to money and securing the future for the generation after them certainly is. I must say that I have a huge respect for many of our traditions and I appreciate the efforts of my parents over my siblings and me. I also feel that children must show courtesy to their parents and ensure that they live their old age in joy and comfort. However, my advice to my generation and readers is to begin to act responsibly. While children should give parents the respect, dignity, care and love they need in their old age, it is the responsibility of parents not only to give their children a good start in life, but also to ensure that at their passing, their children get another generous stab to financial security. In other words, children are not a financial insurance for the future. 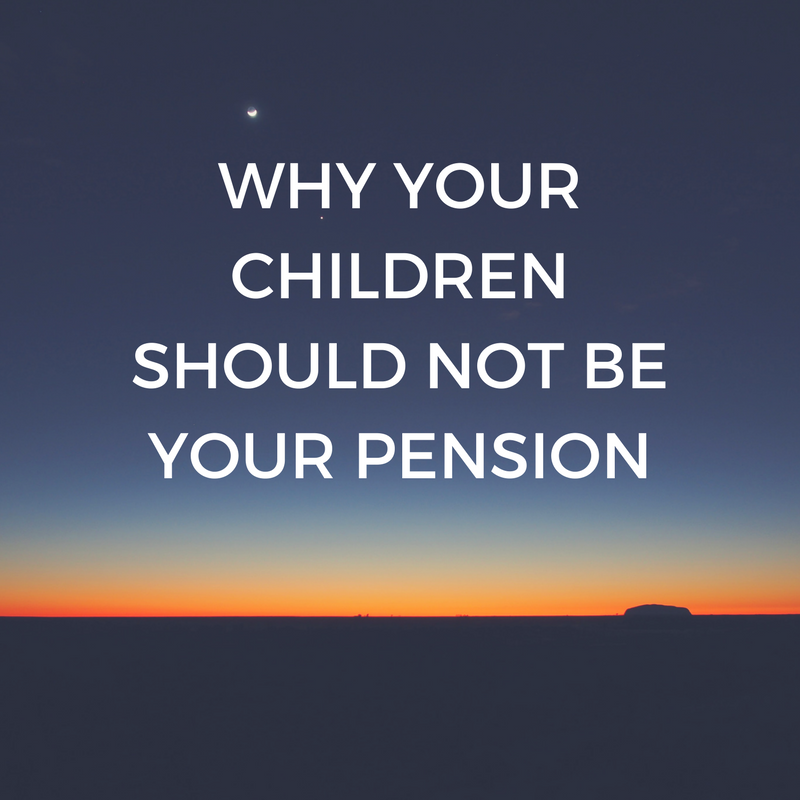 Parents must in fact see themselves as the financial security to their children's future. For parents who do not have the means to provide for their old age, it is of course the responsibility of their children to ensure their twilight years is generously taken care of. This, in my view, should be the exception, and not the rule as is common in our culture. We must desist from 'eating' the present, and then having the future for dessert.